Are The Highest Interest Rates Behind Us? 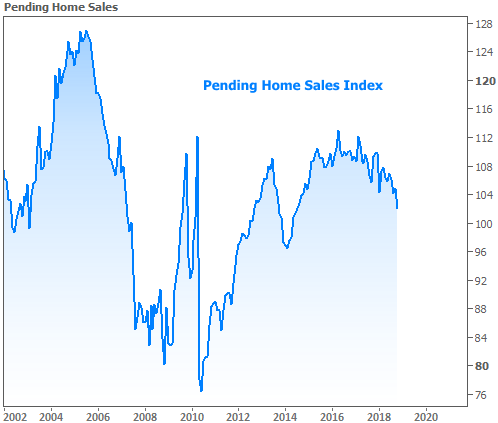 - Prime Mortgage Lending, Inc.
Are The Highest Interest Rates Behind Us? 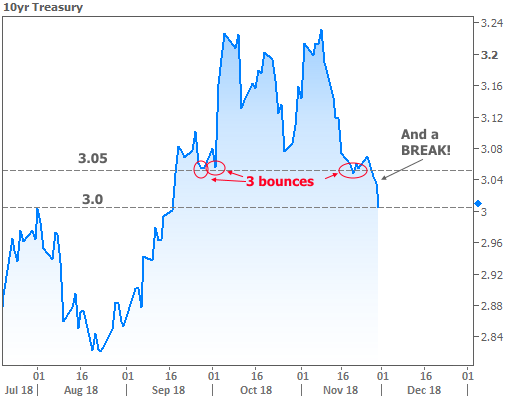 Relative to the last 2 years of pain for rates, a sense of hope has emerged, seemingly overnight, as the 10yr Treasury yield (an important benchmark for longer-term rates like mortgages) broke through a key level. 3.05% had consistently blocked the advance of falling rates for more than 2 months. The most recent bounce happened just last week. Breaking through sets us up to challenge the big psychological barrier at 3.0%. The catalyst for the late week surge was a speech by Fed Chair Jerome Powell. The Fed sets monetary policies that can have a direct impact on rates. Those policies are largely a function of objective economic data, but there is some room for interpretation. The Fed’s interpretation has arguably been fairly balanced over the past few years. On the one hand, they’ve been hiking at a much slower pace compared to past cycles. On the other hand, they’ve been hiking regularly and their outlook has clearly called for those hikes to continue well into 2019. Powell’s speech upset the balance as far as many investors were concerned. Back in October, Powell said rates were “a long way from neutral, probably” before adding that the Fed may even raise rates past neutral (a level that neither promotes or discourages economic growth). He’d been sticking to that script regularly until this week when he said rates are now “just below” neutral. Stocks and bonds both seized on the apparent shift in tone from the Fed Chair. In general, when the Fed is perceived as less likely to hike rates, both sides of the market rally. That can be seen in the following chart with stocks surging and rates falling. 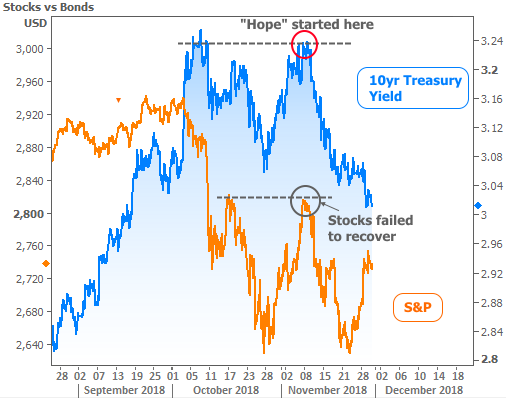 Combined with the positive move in rates that began 3 weeks ago, a sense of hope seems to be returning to the bond market. Keep in mind that at least some of that “hope” will come at the expense of stocks and the economy. After all, rates tend to fall when the economy is weak. You might notice that the blue line (bonds) was more willing to move lower than the orange line (stocks) in November. 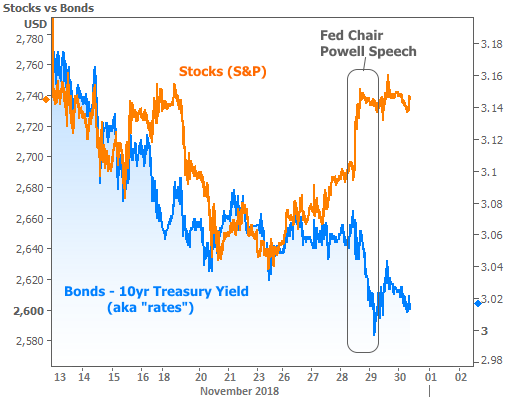 Of course we just discussed the Powell effect, but well before Powell’s speech, we can see bonds setting “lower lows” even as stocks try to hold the same defensive floor. One potential reason is weakness in oil prices. 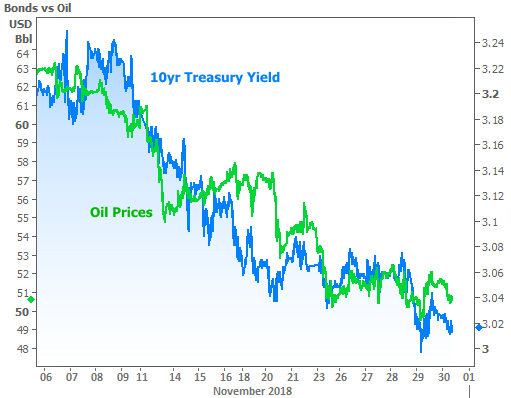 Oil has a bearing on inflation, and inflation has a bearing on bonds. Falling oil prices can add downward pressure on rates. If these positive influences stick around, the highest rates for this economic cycle may indeed already be behind us. 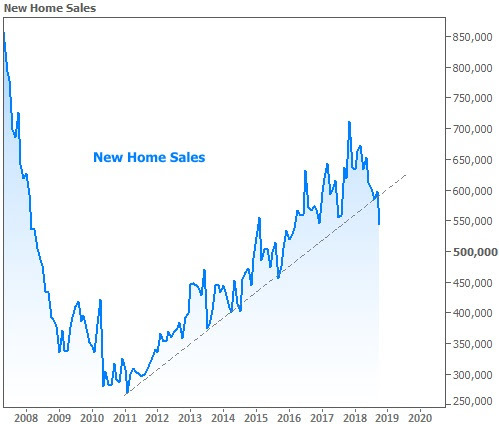 That couldn’t come a moment too soon for the housing market where sales continued to slump according to two reports out this week. Still, it’s not necessarily safe to assume rates will keep moving lower. Keep Powell’s comments about economic data in mind. The Fed will be watching the data closely. To whatever extent next week’s important economic reports disappoint, hope will remain alive for rates. But if those reports are stronger than expected, rates could easily bounce back toward recent highs.